I am named after my father’s mother, Delta Zenobia Barlow, who was born in the Delta region of Mississippi. When I was about seven years old, we went to visit my father’s relatives, for the first time in my memory, on a plantation in Barlow, Mississippi. I have a few faint memories of that journey: deep, rich, red dirt, a big white house, scattered housing occupied by sharecroppers, and a ramshackle building with a hand-lettered sign that read “The Barlow Store.” The whole plantation scene was strange and wondrous and I was trying my best to make sense of what I was seeing. But something happened in that store that made an impression on me: an exchange between the shopkeeper and a sharecropper, as my uncle stood silently nearby, that revealed to me in an instant that the price charged to the sharecropper for the goods in the store, advanced against the value of his crop at the end of harvest, was exorbitant, and that the whole exchange, the whole system if you will, was profoundly unfair and exploitive. I can remember a sense of revulsion, of shame, like a body blow — and I remember flushing all the way to my tingling scalp, as my uncle, supposedly an upstanding, church-going, state senator, credentialed the transaction through his silent presence. The insight that began in that experience, and has been nurtured and reinforced in myriads ways since, is that every intersection in the food system — from planting, growing, harvesting, transporting, processing, packaging and selling to cooking and serving and how we dispose of or recycle waste — is a critical juncture with opportunities to be more creative, wise, and compassionate. That is why I have committed the past nearly two decades of my life to supporting the transformation of school meals along with taking advantage of the opportunity they provide to teach students about everything from health and nutrition to science to economics and the working conditions of the people who grow and pick their food. 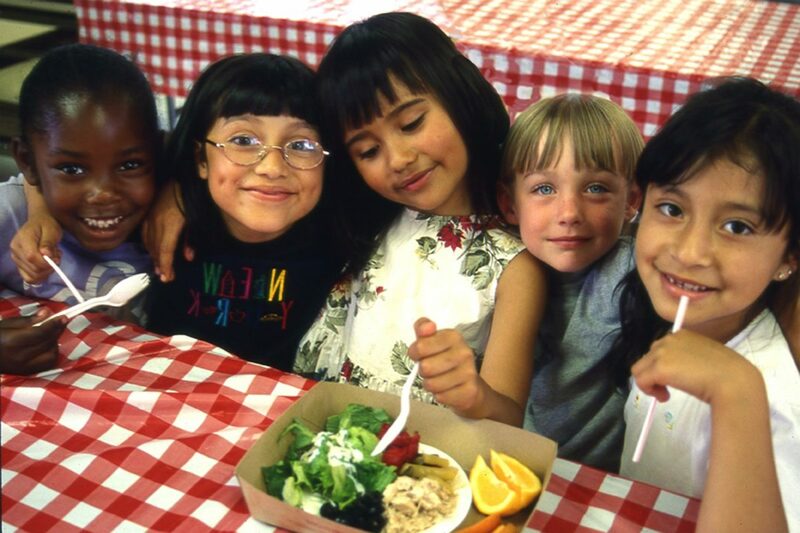 It’s why I believe that California Food for California Kids, a new initiative the Center for Ecoliteracy is launching with support from TomKat Charitable Trust, is a smart, vital, and hopeful strategy. The idea is this: What if California schools — which serve nearly 900 million meals every year — offered students more of the wonderful food that is grown right here in our state? New research, released in a 2012 Center for Ecoliteracy report, suggests that there are significant opportunities to incorporate more of California’s agriculture into school meals — and that means significant opportunities to improve health, education, and the economy. Are California Kids Eating California Food? Discovering Opportunities for Improving School Meals examines 12 important California crops and purchasing by six school districts in the forefront of food service innovation. Developed by principal investigators Ann M. Evans and Georgeanne Brennan, the report reveals that the bounty of California agriculture creates opportunities that schools have yet to fully realize. In 2009, for example, while 7.1 billion pounds of lettuce were grown in California, the six surveyed districts (which enroll about one in eight California students) only purchased 700,000 pounds in 2009-2010. While 2.5 billion pounds of strawberries were grown, the surveyed districts only purchased 567,238 pounds. And while 4.78 billion pounds of rice were grown, the districts bought only 298,307 pounds. In other words, California’s dynamic agriculture makes it possible to serve the best, freshest, healthiest food imaginable. Our schools do not need to depend on highly processed food that is shipped thousands of miles, at high cost to both the environment and the quality of the food offered to children. The health and education benefits are perhaps obvious: We know that healthy students learn better and achieve more, and that serving fresh, delicious food is a way to support student health. At the same time, the magnitude of the state’s financial investment in school food creates an opportunity for a robust partnership between California schools and agriculture — the promise of creating more jobs that come from supporting regional sustainable agriculture and keeping more money within our local economies. Consider: In 2009–2010, the state’s schools received nearly $1.6 billion in cash payments from the federal government for school food programs. The state added another $134 million. Not all of these funds are allocated for purchase of food. But the California Farm to School Taskforce estimates that between 30 and 40 percent is spent directly on food. That’s $520 to $694 million, in addition to $32 million worth of commodity food offered by the USDA to schools in the state. If even 20 percent of that total were spent locally, $110 to $145 million would be added to local economies. A 2011 Ecotrust report calculates that every dollar spent locally for school food adds $1.86 to the economy and that every job created by a district’s purchasing local foods results in an overall increase of 2.43 jobs. Building on the abundance and creativity that is this state’s legacy, a move in the direction of serving more California food to California kids will further our own economy, health, and education and present a valuable model for partnerships between schools and regional agriculture across the country. Affordable and nutritious foods that exist in grocery stores are not accessible in many low-income and ethnic neighborhoods in the U.S, rather in these areas where “food deserts” exist convenience stores and fast food restaurants thrive. Food deserts are places where people experience physical and economic barriers to accessing healthy foods such as little mobility. We are past a point of individual responsibility to choose the healthiest foods; rather we have entered an age where policy and institutional change are needed to create equal availability and access for everyone. Incorporating local foods into school lunches could be the perfect pathway to introducing healthy eating habits to kids while supporting local farmers.